NATO isn’t providing the security the Polish government has long wanted. Warsaw is not sure the Trump administration will either. Ahead of the NATO summit in July in Brussels, Poland is pulling out all the stops. It wants the United States to deploy American troops in Poland on a permanent basis. And Warsaw is willing to pay $2 billion to establish joint military installations and provide more flexible movement of U.S. forces, according to the defense ministry. Poland is only seeking what the Baltic States and Central European countries have been requesting ever since they joined NATO in two waves—in 1999 and in 2004. They want the alliance to fill the security vacuum in this part of Europe. For them, that means putting boots on the ground and on a permanent basis, compared to the system of rotation that NATO agreed to four years ago at its summit in Cardiff, Wales. And for them, it is the presence of American troops that will provide the dual role of deterrence and defense against any Russian threat. But politically, the request is about something more fundamental. It’s the knowledge that Europe is not up to the task of providing the security and defense necessary to protect the continent. “Can Europe defend itself?” asked Ivan Krastev, director of the Center for Liberal Strategies in Sofia, who opened this year’s Körber History Forum in Berlin on May 28. “Is Europe failing the post-war project? It takes the peace for granted,” he told the audience. Krastev’s remarks had a particular resonance for Germans. Ever since the reunification of Germany and Europe, the German armed forces has become so depleted and so devoid of leadership and strategy that it cannot even fulfill its obligations to NATO’s rotational deployments in Poland and the Baltic States. Poland’s request is a long-standing one. Former foreign minister Radek Sikorski (who also did a stint as a defense minister) made it one of his top priorities. But during the early stages of the Obama administration, when there was a U.S. pivot away from Europe to Asia, Sikorski saw the need for the EU to establish a credible defense and security policy. Well, that hasn’t gotten very far—and not just because Britain blocked the calls for the EU to establish its own military headquarters. It was because, with few exceptions, Europe does not act strategically. 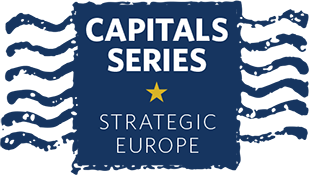 Indeed, whatever the outcome of the big clash between the Trump administration and the Europeans over Washington’s decision to pull out of the Iran nuclear deal, it is not going to be the catalyst for Europe to develop strategic autonomy. In short, despite the other differences between Europe and the United States over trade and climate change issues, America is Europe’s security umbrella. There is another reason why Poland has put this request way up on its foreign and defense policy agenda. Because Berlin, Paris, and London want Iran to stick to the nuclear deal, they are seeking as much support as possible from Russia (and less so from China). Similarly, because Europe’s big countries want some end to the war in Syria, the Poles are nervous about them doing a deal with Vladimir Putin. Warsaw fears that given all the strains in the transatlantic relationship, particularly between Merkel and Trump, Russia will be able to exploit these tensions. After all, Russia’s goal has consistently been focused on weakening the ties between Europe and the United States—which would have an immense impact on NATO. And Russia’s other goal has been to establish and maintain a special relationship with Germany through the cultivation of the Ostpolitik, or the special Eastern policy that has long been the cornerstone of the Social Democratic Party’s attitude towards Russia. So far, however, neither German Chancellor Angela Merkel (and her foreign minister Heiko Maas) nor French President Emmanuel Macron show signs of wavering. They are not prepared to do any kind of grand bargain with Putin by lifting sanctions imposed on Russia after its annexation of Crimea and its proxy invasion of eastern Ukraine in 2014 for Moscow’s support over the Iran deal. Yes, Merkel and Macron speak of wanting a dialogue and some kind of partnership with Russia, as they both declared in their recent separate meetings with Putin. But so far, Putin has given no indication what he would be prepared to put on the table—whether it be Russia’s role in Ukraine, Iran, or the war in Syria. That so-called approach by Russia has given German and French diplomats little reason to be optimistic about improving relations with Moscow. And that is certainly the view shared in London, particularly after the Skripal affair. One of the few certainties about the Polish defense request is that it will elicit the same reaction from Moscow (and some NATO countries) when the alliance decided to deploy troops on a rotational basis to Poland and the Baltic States: that it’s a provocation and breaks the tacit agreement made between NATO and Russia back in 1999 that no alliance troops would be permanently based in Central Europe. Those were very different times. For Poland, NATO has to readjust even more. Seccurity vacuum ii East-Central Europe has for centuries been a geostrategic reality just because we have geography the way we have it (remember 2 World Wars). All those pathological fears of the Balts, the Polish elites or even some Scandinavians concerning a "Russian invasion" readily nourished by the US strategists who with a flow of time become more and more illiterate (no more Kissingers, unfortunately), look absolutely ridiculous, to say the least. The case of the Crimea is a wrong example, and Putin is not an idiot or a thirsty fanatic. He is the most pragmatic person, believe me. More US tanks on the Polish soil won't bring more security although the Americans are almost ready to play those ghastly games to make Europe fully nervous and unstable. And almost nobody in Europe is trying to concentrate upon one simple thought - when and how are we going to obtain a future for a truly secure continent with the US war mongers messing around and Russia being constantly sanctioned and blamed for anything that is going wrong? Someday Europe will cry bitter tears after years of hiding in the American shadow while being finally victimized by utterly different threats other than Russia. Neighboring the Trojan horses like Britain and its bright stars like Boris also is not a privilege. Better start contemplating about common good instead of further inventing horror stories! Let's try at least! The article, when juxtaposed with development in South Asia, particularly vis-a-vis Pakistan; brings to light the toughening American foreign policy world-wide. By now it is amply clear that Mr. Trump is no respecter of 'let the apple-cart roll on' sobriety of yesteryear, the deviation is now markedly shifting the global balance of power. Judy Dempsey's analysis is a pointer of European compulsions in the fast-changing international politics. When the Soviet Union started falling apart in 1989, Italy, Austria, Hungary and the Socialist Federal Republic of Yugoslavia (SFRY) created an economic alliance called the Quadragonale. They admitted Czechoslovakia in 1990 and renamed it the Pentagonale, and Poland in 1991 creating the Hexagonale. Germany, after a series of secret negotiations with the Soviets, got the green light to unite in 1990. The US was caught with its pants down because before they could access all East German secret archives, they were moved to RuSSia or destroyed, albeit most were seized by the CIA. Germany felt threatened by the Hexagonale because it might have ruined German and then Soviet plans to overrun Europe economically, hence they attacked its weakest link, the Socialist Federal Republic of Yugoslavia by sponsoring separatist movements in the SFR of Yugoslavia resulting in the separation of Slovenia and Croatia from the federation. That separation triggered other separatist movements, the separation of Bosnia-Herzegovina and eventually civil war. The introduction of NATO peacekeepers in 1995 was a fallout of the German insidious action that had triggered the whole mess that eventually led to a genocide of Muslims and the 1999 NATO bombing of some infrastructure of the former Yugoslavia in order to destroy Serbian army supply routes and end the slaughter. The Poland and Croatia-initiated Tree Seas Initiative is the resurrection of the Hexagonale idea, but this time it has some support of the Trump administration and the US Congress, hence the growing US military reinforcement of this region. This initiative, if successful, will prevent any physical land connections of France and Germany in the west and Russia in the east. Russia and Germany have cooperated against interests of smaller Central and Eastern European states for centuries. Russia triggered and implemented, together with Germany and Austria, the partition of the Polish-Lithuanian Commonwealth at the end of the 18th century and the occupation by the Russian empire of close to 90% of its territory for 123 years until 1918. Poland is missing the point here as is NATO. A former Warsaw Pac country now wants the military NATO juggernaut to move permanently to Poland is insane. What is NATO doing there in the first place? Isolate Russia. Usurp it. Then rob its resources. While forcing Europe to forgo normalized trade with Russia which hurts Europe but not the US who want to trash what they cannot control. NATO is the Amerikan Imperialists catspaw. The question “Can Europe defend itself?” has a simple and clear answer: No. The warrying tribes arriving on horseback in Europe, in the depth of time, kept fighting and fighting, from tribe to empire, from sword to hypersonic nuclear tipped missiles and autonomous killing machines. The war started in 1914 wrote the history of the future, it just goes on and on. From a historical perspective Poland’s fears are understandable. Left alone to withstand the Nazi war machine in 1939, Katyn, abandoned in 1945, the shifting of frontiers, will never fade away from collective memory. The USSR armies didn’t cross the Fulda gap, when the Warsaw Pact was at its height; the Russian Federation armies will not cross the Suwalki gap. It is simple arithmetic: GDP is 5% of that of NATO countries; the military budget is an accounting error compared to that of NATO, and it is year after year, a cumulative gap. The weapons proudly displayed by Putin recently are not war weapons, they are life extinction ones, matched easily in terms of effects by the strategic nuclear triads of the USA, China and India, even France and the UK. Obama’s ERI, continued by the present administration (Ironhorse arriving) is more than enough to assure anybody in Europe that the US soldiers and taxpayers will bear the brunt of any war there, including the quick escalation to nuclear war. The monetary offer is bizarre, to say the least. 2 billion dollars for an armored division means little, and that money would be far better used to train and arm local militias, along the Swiss popular war doctrine (and 2nd Amendment). Moreover, armored divisions might be the weapons of the past. Obama would have used better the ERI money to prepare for cyberwarfare; it is almost inconceivable that a State Secretary was using devices connected in any way to the outside world, without the NSA detecting and shutting down immediately, or that a party can be hacked by phishing and outsource IT. Obama’s campaign use of Cambridge Analytica style methods was well documented at the time, it should have never been used and stopped based on principle. Worse, these events were not used as a Sputnik moment to try to fix education in anything related to technology. When will this end? Sarah Connor asks in Terminator 2: “because if a machine, a Terminator, can learn the value of human life, maybe we can too.” As in many Hollywood movies, optimism is misguided; if an AI reaches this conclusion through deep learning, it will be terminated.